The one-and-a-half life-size (or, as described in the original call for funds, “heroic size”) statue of Samuel de Champlain is easy to see from the Alexandra Bridge, east of St. Patrick Street and high up on Ottawa’s Nepean Point above the Ottawa River. On its two-metre granite pedestal, it floats well above the land it claims and any who come to see it. 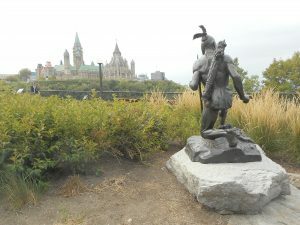 Across the street in Major’s Hill Park, 350 metres to the west, hidden amongst the tulip beds and kneeling in the dirt, is the Champlain statue’s companion piece: a life-size statue of an Anishinaabe scout. In Canada, there is no forgetting that we live in colonized space, created and still ruled-over by dead white men. These statues are the markers of their continued authority. Whether it’s monuments to European explorers (like Champlain) or our street names (ever been to Colonization Avenue in Dryden, Ontario? ), lakes, rivers, and islands (like Amherst Island, named for Lord Jeffery Amherst, who proposed giving smallpox-infected blankets to the Odawa), markers of European exploration, warfare, settlement, genocide, and fraud are everywhere. Together, they announce that the colonizers not only took the land they stumbled upon, but also that they remade its history to erase any record of the ills of their arrival. Hamilton Plantagenet MacCarthy cast the bronze of Champlain in 1915 to commemorate the tercentenary of the explorer’s second voyage up the Ottawa River and his two weeks in the area. Champlain remarked in his journal “The neighbouring country is filled with all sorts of game, so that the savages often make a stop here.” The face of the statue is supposedly based on the likeness of Benjamin Sulte (a prolific, local historian of the time and a key proponent for the statue), and it has its right arm raised to hold an astrolabe to the sun. Famously, the astrolabe is held upside down. Below the plinth on which Champlain stands is a marble platform stained by the statue’s corroded bronze. It was here that the statue of the kneeling, un-named Scout once stood. Cast by MacCarthy in 1918 (based on the likeness of an unnamed Anishinaabe model) it was added in 1924 at the behest of a citizens’ committee that, in a fit of white guilt, demanded something to recognize Indigenous peoples’ contribution to Champlain’s explorations. Though his hips and legs are planted square, the Scout’s upper body twists slightly to the right, some say in preparation for battle with Parliament, which he can see across the Rideau River Canal’s outlet. Others interpret him as looking back across the 350 metres to his original location below the Champlain—either in longing or concern. Longing for an old friend or concern that Champlain will soon get lost without him, especially given his obvious unfamiliarity with an astrolabe. The history of the Scout’s movement offers a miniature model of Canadian history itself. In June 1996, Ovide Mercredi, then-Grand Chief of the Assembly of First Nations, led protestors to Nepean Point, where Mercredi covered the Scout with a blanket to hide what he felt was a demeaning representation of Indigenous people and to protest the statue’s subservient position below Champlain. Mercredi gave the National Capital Commission (which administers Ottawa’s public lands) one year to remove the statue. Before this, in 1963, the Scout had been attacked by vandals in retaliation—or so read the vandals’ explanatory note—for the defacement of the monument to General James Wolfe in Quebec City by the Front de libération du Québec. The Scout’s left knee was damaged in the attack. Four years later, in the midst of the construction of the Astrolabe Theatre on Nepean Point for Canada’s centennial, students from Gatineau (just across the river) kidnapped the Scout for a carnival rally. Responding to Mercredi’s criticism, in 1999 the NCC moved the Scout across the road to the north end of Major’s Hill Park, where it remains. At the time though, the move provoked public furor: in an Ottawa Citizen survey on whether or not the statue should be moved, nearly three quarters of 500 respondents objected. 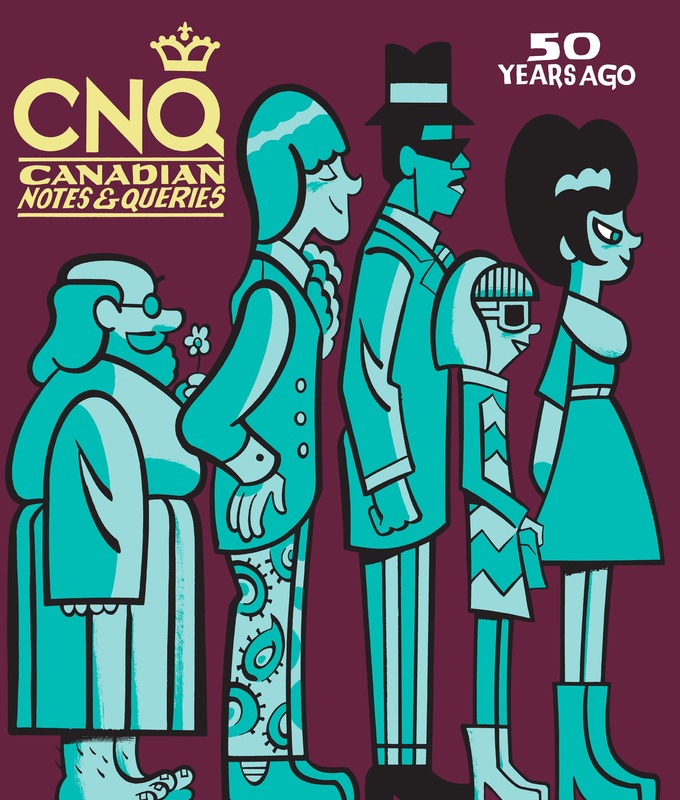 At the time of the move, the NCC promised to feature the Scout in a future monument to Canada’s First Peoples—a promise that was never fulfilled. As the Champlain monument at Nepean Point has been altered and manipulated over time, so has its meaning. In the first nine years of its life (when Champlain stood alone on his plinth), terra nullius ruled: Champlain’s unobstructed view of the Ottawa River Valley fulfilled the imperial fantasy of the European explorer looking over his new-found land—silent, empty, and awaiting his command. The addition of the Scout, in 1924, didn’t do much to modify this narrative. As the academic Susan Hart stated in her 2005 article on the controversy in Espace magazine, Champlain’s astrolabe connects him to culture and science, while the Scout’s bow and arrows connects him to nature and a “vanishing way of life.” Worse, the Scout’s kneeling posture and benign countenance could be seen as silent acquiescence. The vandalism to and kidnapping of the statue in the ’60s added to the Scout’s connotation as a plaything, whether for white settler schoolchildren or as a pawn in the culture wars between the French and English. Just as many First Nations people were moved from their lands to postage-stamp-size reserves, the Scout was moved to his—all that’s missing is his X mark on a treaty. The final movement of the Scout from its prime real estate at Champlain’s feet to an out-of-the way location across the road may have disrupted the hierarchy between the two monuments, but it also acted as an unintentional simulacra of Canada’s past. Just as many First Nations people were moved from their lands to postage-stamp-size reserves, the Scout was moved to his—all that’s missing is his X mark on a treaty. 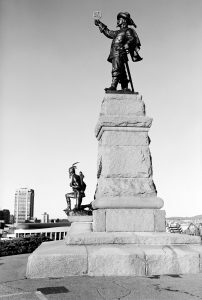 Indeed, through his removal, the Scout became both a romantic mannequin of the “vanishing race” and of the disappeared—cleansed from the serious, monumental history of Canada over which the statue of Champlain alone presides. The Scout is no longer even cited in the official record of the place. In January 2017, the NCC launched an international design competition for the redevelopment of Nepean Point as part of Canada’s sesquicentennial. The document launching the competition stated that “The majestic statue of Samuel de Champlain . . . will remain a feature of the site.” No mention was even made of the Scout. Adding to the theatre: both the Scout and Champlain monuments rest a few hundred metres from the northern border of the Algonquin land claim, the largest unsettled land claim in Ontario. This means that the statues—which bid us remember a man and his imagined Indigenous guide who found land that was not lost and claimed land that was not Champlain’s to claim—are officially on stolen land. Given its accrued symbolism, it’s no wonder the Scout has been the focus of recuperative efforts to rewrite what the statue means and to reimagine its representations of Indigenous people. First Nations artists like Jeff Thomas and Greg Hill have used the Scout—both the statue and its signifying absence from the Champlain monument—in a number of inventive ways to reinsert Indigenous people back into monumental history. 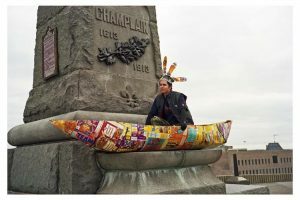 With no plan from the NCC on redeveloping Champlain’s empty plinth, in 2000, Thomas invited Hill to pose on the platform the Scout had occupied—Hill brought a canoe made of cereal boxes to stand in for the one the Scout was never given. They then portaged the canoe across the street to visit the Scout. Hill’s other performance art—like Joe Scouting for Cigar Store Lasagna and the installation Monument ForeigNation and the performance version Real Live Bronze Indian—rely heavily on the Scout as well. In 2013, a group of Indigenous artists held a ceremony with Algonquin elder Annie Smith St. Georges to rename the Scout Kitchi Zibi Omàmìwininì Anishinàbe, which translates to “big river people,” what the first people of the Ottawa River Valley called themselves. In a time when Canada regularly gives lip service to reconciliation, what role do mementos of Canada’s colonial past have in the present? Who are they for and whom do they exclude? 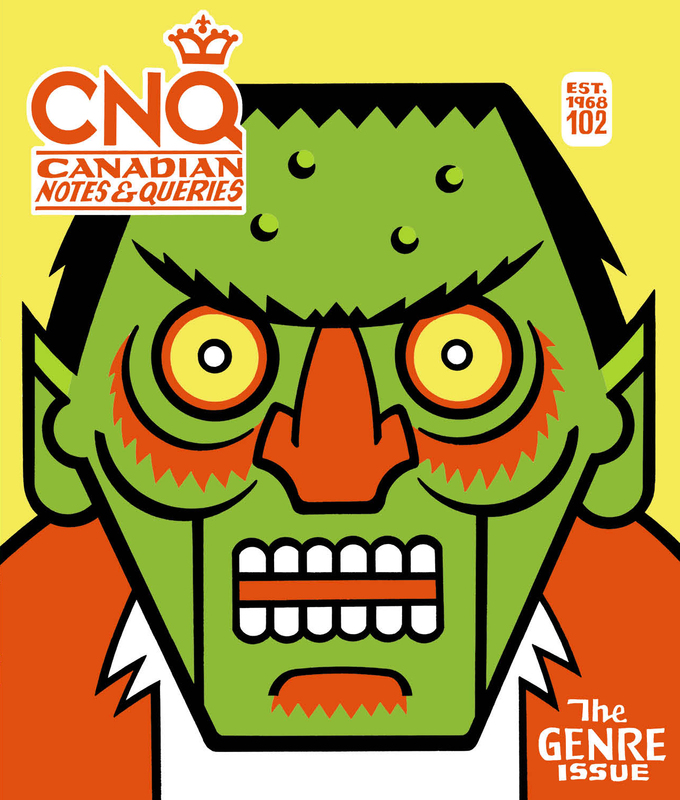 Do they help settler Canadians remember the complexity of their histories or have they just become rallying points for those nostalgic for a time when racial hierarchies and ideas of white superiority went unchallenged? If, as a settler society, Canada is beginning to slowly rethink itself, shouldn’t representations of our history also be rethought and recast? Though many still balk at the idea of removing the statues that glorify our settler past (75% of respondents in a 2011 Ottawa Sun poll wanted the Champlain statue to stay), it is happening. Early in 2017, the Law Society of British Columbia removed the statue of Matthew Baillie Begbie, the first Chief Justice of BC, for his role in hanging six Tsilhqot’in Chiefs in 1864. In Halifax, as a result of continued protest from Mi’kmaq leaders, the statue to Edward Cornwallis (the founder of Halifax who issued a bounty for Mi’kmaq scalps) was removed at the end of January—though not without counter-protests from the far-right men’s organization “Proud Boys” and others. The removal of these statues offers a window onto how communities can begin to dig themselves out from under all the contradictions of their accumulated histories. In Ottawa, the wording of plaques has been changed and an offensive statue has been written out of the official record, and yet little has ever been done to reimagine what could take the place of the offensiveness of the original Champlain statue. Even the NCC’s supposed reimagining of Nepean Point (first phase of construction planned for 2019-2020) does nothing but burnish old settler stories. Though the Anishinaabe have lived here for thousands of years—long before any French explorer wandered through—you’d never know it by the city’s monuments. If we are to take the Scout statue as recognition of First Nations contributions to Canada (albeit as a recognition trapped in racist clichés), then it must also be recognized that that contribution has been effectively coopted, diminished, and forgotten. Reconciling this space will take what for white settlers will seem a radical relinquishing of control as well as a reimaging and recasting of stories, and bronze.